Radio commentator Paul Harvey used to have a segment of his news show entitled "The Rest of the Story." In that segment, he would take something commonly known, such as a news event, and provide little known and interesting background about what had happened. With the new Steven Spielberg movie "Lincoln" playing in the theatres this Thanksgiving, there has been some discussion of Lincoln's role involvement in the passage of the 13th Amendment is portrayed. That made me think of "The Rest of the Story." 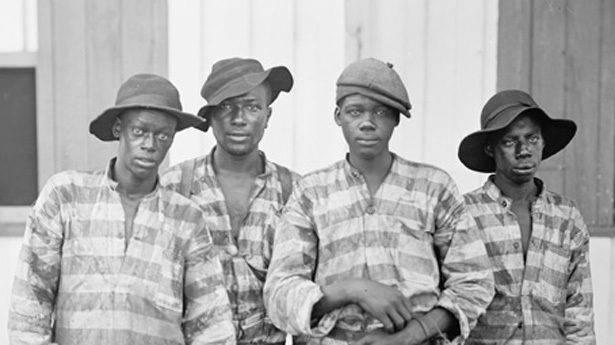 Photograph from PBS's Film "Slavery By Another Name"
The description does not do justice to the film. 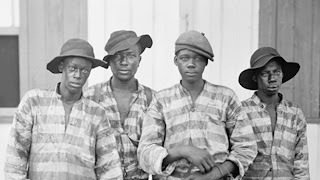 Viewers will be shocked how African-Americans were locked up based on "pig laws" or "black codes" adopted in southern states, laws that made such things as being without a job a felony. (For a description of those types of laws, here is a link.) When they were incarcerated in prison, the states would then rent out the prisoners out to companies and others needing workers. As the film details, treatment of these African-Americans prison laborers under this new system was often worse than under slavery. Because these post-Civil War bosses were merely "renting" these workers, they did not have the "investment" in them that the slaveholders had in what they had considered their "property," i.e. their slaves. The film can be viewed in its entirety by going to this link. The drug war is nothing but an extension of this type of slavery - locking people up for non-violent crimes such as selling pot, an action that was legal until, what, the 1930's ? Others are attempting to bring this system back, by charging prisoners for room and board.